Fourth Row Center: Film Writings by Jason Bailey: On DVD: "Contact"
It’s funny how youth and the passage of time can warp your perception of a film’s quality. I was in my early 20s when Robert Zemekis’ Contact unspooled in theaters, and my memories of it are entirely positive; it was the director’s first feature since his Forrest Gump swept the Oscars, based on the acclaimed novel by Pulitzer Prize-winner Carl Sagan, and was praised by critics as a rare example of thoughtful science fiction, a movie that dared ask questions about what exactly existed beyond our horizons. Though audiences were split on a key climactic revelation (more on that later), the film made a mint at the summer box office. Twelve years later, Contact doesn’t quite hold up. It’s not that it’s a poorly made film; quite the opposite. And it’s not that it’s a dumb film—not exactly. But it is a movie that thinks it’s smarter than it is, so busy signposting its points and mouthpiecing its debates that it becomes a pablum. Oh, and it’s got a Matthew McConaughey performance that we all should have heeded as a dire, stern warning. 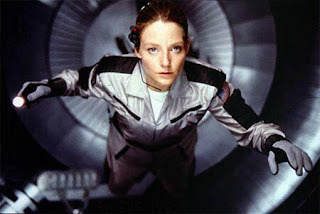 Jodie Foster heads the A-list cast as Dr. Eleanor “Ellie” Arroway, a driven scientist with the Search for Extra-Terrestrial Intelligence (SETI) program. We see, in Rockwellesque flashbacks, how her interest in what lies beyond the stars was encouraged by her aw-shucks father (David Morse), but her stubborn determination has made her less than popular with her government supervisor, David Drumlin (Tom Skerritt). After her funding is pulled, her cause is picked up by an eccentric billionaire (John Hurt), and she eventually receives what appears to be a signal from another life form. The revelations of that signal—how they receive it, how it is decoded and interpreted, and what becomes of that data—showcase Zemekis and his crew at their best; the sequence where it is descrambled, with the help of some software and an errant TV set, is indisputably thrilling. The plot turns that follow (the discovery of what the data means, the building of the “transport,” and the bumpy road to its use) are all clever, believable, and fascinating. There’s no question that the film is structurally sound—it propels from scene to scene smoothly, and our attention never wavers. But most of what works is (presumably) transposed from Sagan’s novel. The screenplay proper, by James V. Hart (Hook, Sahara, Bram Stoker’s Dracula) and Michael Goldenberg (Bed of Roses), is kind of terrible. The dialogue is all boilerplate, dull exposition and bland pronouncements. There’s nothing to explore in the writing, nothing for the viewer to sink their teeth into—it’s all transparent, all surface. The questions of faith and its coexistence with science are compelling, but the discussions of it are, for the most part, dumbed down for the mass audience; at the end of the film, when a senator thunders at Ellie, “Are you really going to tell us that we should take this all… ON FAITH?” it lands with the subtlety of a sledgehammer to the balls. The romance between Foster’s Ellie and the smolderingly charismatic religious figure played by McConaughey is a non-starter, a perfunctory distraction; they’ve got zero chemistry, and his performance is just awful. This was his first film after his (admittedly impressive) breakthrough in A Time to Kill, and it’s got all of the inappropriate grinning, wooden line readings, and general half-assed coasting that we’ve come to expect from the handsome but empty actor. When he’s on screen, you’re embarrassed for him; you can’t wait for his scenes to end. Foster may not be stretching much, but she’s able to carry Ellie’s lingo-heavy dialogue credibly and fill in the blanks of her character admirably (a very young Jena Malone, as the young Ellie, makes for a remarkably effective Foster doppelganger). The rest of the cast is somewhat at the mercy of their flat lines; Tom Skerritt can play this kind of smug authority figure in his sleep, and while he has some good moments, he has a hard time recovering from his opening line (“Now I remember why I took that desk job!”), which sounds like something cut from a lesser Lethal Weapon sequel. James Woods is also basically playing the “James Woods role,” but what the hell, nobody does it better than he does. At the time of the film’s release, I remember fiercely defending the controversial reveal at the climax—I won’t go into it here, except to say that while I still think it’s a fine idea, the scene would play better if it didn’t get so bogged down in platitudes. But that sequence at least shows Zemekis and his writers taking a chance, experimenting with a narrative move that would presumably not be a crowd-pleaser. It’s a film that could have afforded to take more risks like that one. This review has turned into a list of all of the things that Contact does wrong, which wasn’t my intention—there’s a lot that it does right. The filmmaking is near-flawless, particularly the deservedly famous opening shot (which still knocks me out) and the how-did-they-do-that shot involving young Ellie’s run to the medicine cabinet. The visual effects are, for the most part, downright stunning. And when it arrives at the climactic launch scene, Zemekis (who, lest we forget due to his recent lack of interest in making movies with flesh-and-blood actors, helmed Roger Rabbit and Romancing the Stone and the Back to the Future trilogy) harnesses a genuinely exciting sense of wonder. The man may have a tin ear for dialogue, but he can sure as hell build a sequence. Those moments of greatness may be the ones that attached themselves to my memory, while the rest of the movie faded away. But the rest of it is there, and it’s kind of a mess. At the time of its original release, critics that I admire compared Contact to modern classics like Close Encounters of the Third Kind and 2001: A Space Odyssey. Seen clear-eyed, Contact aspires to reach those heights, and fails. There are moments of tremendous power, wonder, and suspense, but there are also reams of terrible dialogue, a heavy-handed attempt at message, and an unnecessary romance with an uninteresting character played by an untalented actor. It’s a mixed bag, and those who look back on it fondly might prefer to hang on to those memories than to revisit this problematic picture. “Contact” was released on Blu-ray on Tuesday, October 6th.